Mechanical Beam Scale -- Great for Doctor's Offices! Precise, robust and convenient! Patients, doctors, and home users will benefit more from the seca 700. More precision due to the 0.1 lb graduation and a higher capacity of up to 500 lbs. The included height measuring rod has a range from 24" to 78". The seca 700 is equipped with integrated transport castors for mobile and flexible use. Some Assembly Required. 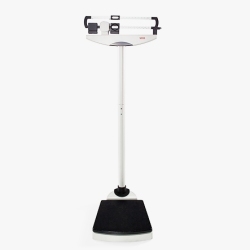 Price Includes Ground Shipping (cont'l US) The seca 700 mechanical column scale with the eye-level balance beam sets new standards worldwide – for capacity, graduation and quality. The seca 700 has a cast iron base, iron column, and an easy-to-use interface. Moreover, the compact packaging helps keep freight costs to a minimum. 20 1/2 x 61 1/4 x 20 1/2"
13 3/4 x 3 1/4 x 14 1/4"